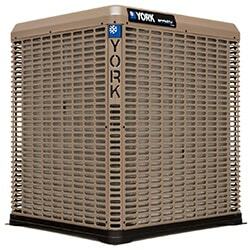 YORK® LX YCE Series split air conditioning units feature durable steel coil guards and long lasting powder coat pain. These units are designed with a cutting-edge compressor for sale and reliable operation. They deliver advanced efficiency to your homes and businesses. 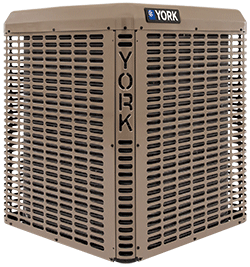 YORK® LX YCG Series split system air conditioners are designed with durable steel coil guards, long-lasting powder-coat paint, advanced compressor technology and high-end reliability testing. They come with friendly R-410A refrigerant to ensure maximum efficiency and comfort. YORK® Affinity™ YXT systems are smarter, more efficient and more reliable than other air conditioning systems. These units provide the highest level of comfort that your indoor environment deserves. 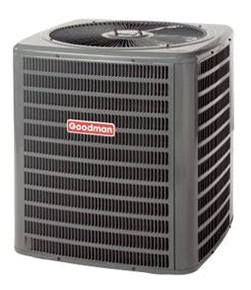 These residential systems work Up to 21 SEER efficiency to keep your cooler for a lesser cost. They have variable-capacity compressor for efficient and quiet operation. The compressor in your new DSX18 air conditioning system is covered by a Lifetime Limited Warranty*. If the compressor ever fails, a new one will be provided to the original purchaser of the central air conditioning system as long as they live in the same single-family residence. With this central air conditioning system, you will enjoy top quality, high-efficiency cooling and an environmentally friendlier chlorine-free refrigerant — all at a refreshingly affordable price. All functional parts area covered by a 10-Year Parts Limited Warranty. * For a full description of all warranties applicable to this product, please review the consumer brochure or product warranty by clicking on the links below. * To receive the 10-Year Parts Limited Warranty, online registration must be completed within 60 days of installation. Registration is not required in all states. Online registration is not required in California or Quebec. This unit is backed by a 10-Year Parts Limited Warranty*. For a full description of all warranties applicable to this product, please review the consumer brochure or product warranty by clicking on the links below. 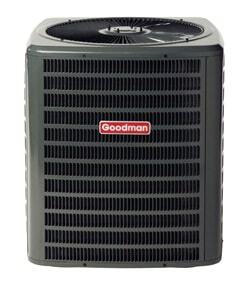 The Goodman® GSC Commercial Air Conditioner cabinet features a powder-paint finish over heavy-gauge galvan-ized steel that provides premium durability and improved UV protection. The unit’s attractive louvered metal guard protects the coil from damage and strengthens the unit.